​Jo Matthews founded White Heron Design to showcase her beautiful lamp creations. While rummaging through old treasures in vintage markets, op-shops and second hand stores, Jo became increasingly drawn to the wonderfully diverse range of vintage lampshade frames and stands. Despite their various states of disrepair, Jo recognised their potential and developed a passion for rescuing, restoring and transforming these base lamp elements. Every finished lamp is unique, from the wood turned curves and colour of the vintage stand, to the shape and fabric of the shade. 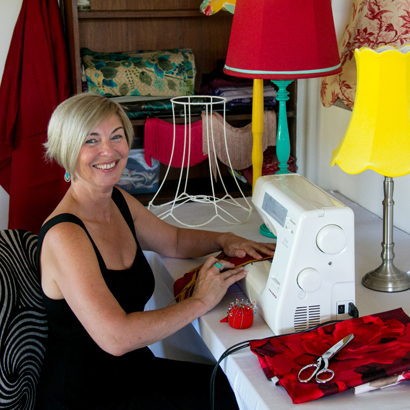 Jo has perfected her skills in pattern making and frame restoring, with particular attention to detail given to the selection of the ideal fabric and lining to bring each lampshade to life. The timber stands are restored by a master painter, who removes the scars of their previous life before applying at least six coats of paint to create an incredibly flawless finish with deep, reflective colour. Each lamp's transformation process takes a number of weeks to complete and Jo takes great care to ensure each is a standalone piece of art that cannot be replicated. White Heron Design offers original handcrafted, one-off, rich sumptuous lamp creations. Through our fusion of textiles, colour and form, each lamp has been transformed into a unique work of art, that evokes an equal sense of intimacy and romance, as they do high drama. By day they are a statement piece in any room, by night they come alive illuminating their surrounds and transforming themselves into something simply mesmerising. Search our online store to find the perfect lamp for your home decorating needs.